Southern Star Productions, Academy of Television Arts & Sciences, Wang Film Productions Co., Ltd.
We all wished we had this poster in our rooms. Taking the war on drugs to Saturday mornings, McDonald’s and Ronald McDonald Children’s Charities financed the production of an animated special that united several cartoon characters from various popular programs at the time. It was the biggest, most ambitious entry in the national anti-drug campaign. 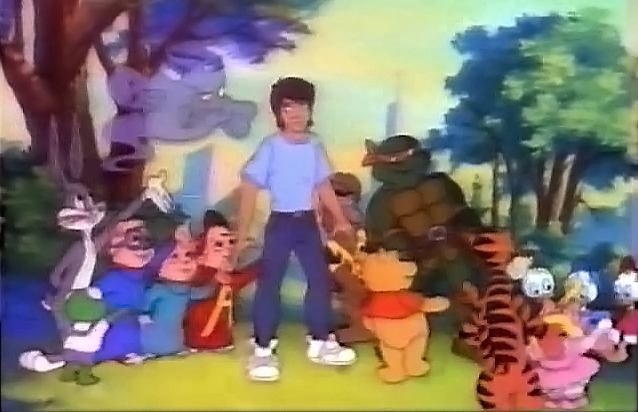 Michael and Smoke are confronted by the cartoon characters. 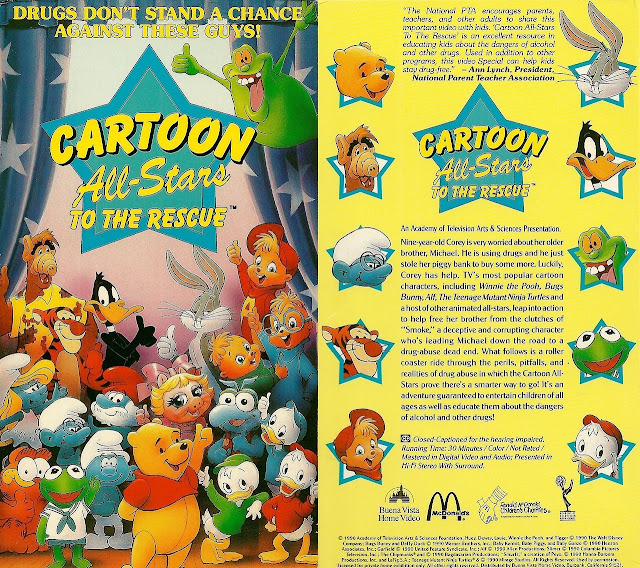 Written by Duane Poole and Tom Swale, with a musical number by Howard Ashman and Alan Menken, Cartoon All-Stars to the Rescue centered on teenaged Michael (Jason Marsden) who had taken to using marijuana and stealing his father’s (Townsend Coleman) beer. Michael’s younger sister, Corey (Lindsay Parker) grows worried about Michael as he begins acting differently. When Michael steals Corey’s piggy bank for money to buy more drugs, the various cartoon character items in her room came to life to help her track it down and then to convince Michael to abandon his drug habits. 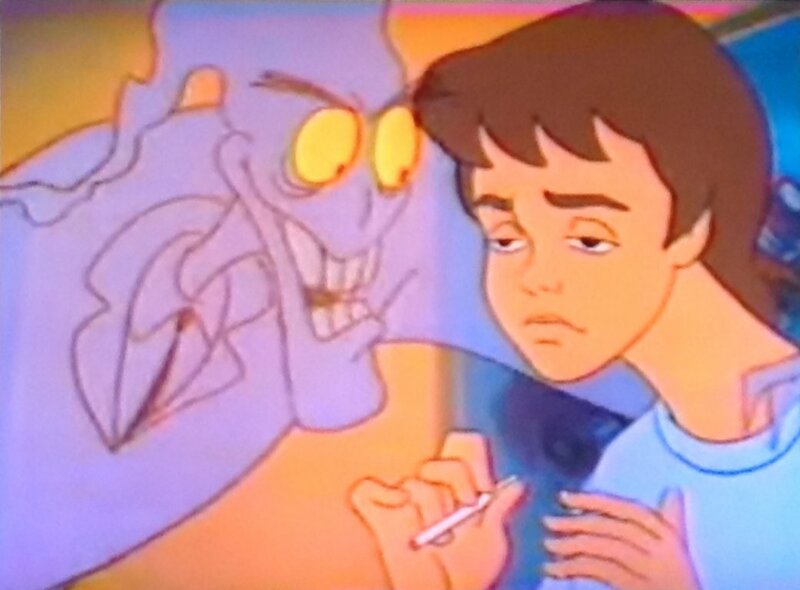 But they have their work cut out for them when Michael is constantly influenced by the living smoke creature aptly-named Smoke (named on the VHS but never in the actual special, voiced by George C. Scott making his voice-acting debut). 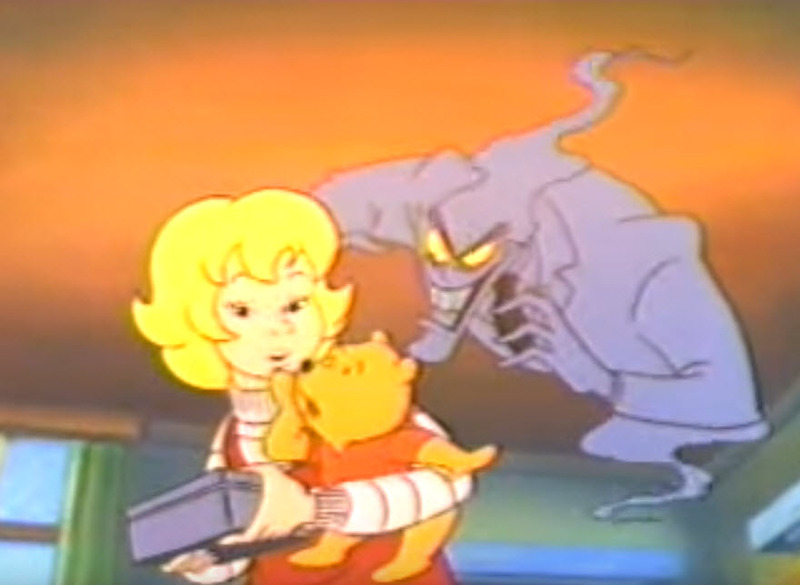 Smoke and Pooh battle for Corey's soul. Featured characters included Papa Smurf (Don Messick), Brainy Smurf (Danny Goldman) and Hefty Smurf (Frank Welker) from The Smurfs who emerge from a comic book (Smurfette appeared in promotional artwork but didn’t appear); ALF (Paul Fusco) from ALF: The Animated Series who emerges from a picture; Alvin, Simon (both Ross Bagdasarian) and Theodore (Janice Karman) from Alvin and the Chipmunks who came off of a record sleeve; Garfield (Lorenzo Music) from Garfield and Friends as a lamp; Winnie the Pooh (a stuffed animal) and Tigger (both Jim Cummings) from The New Adventures of Winnie the Pooh; Baby Kermit (Welker) as an alarm clock, Piggy (Laurie O’Brien) and Gonzo (Russi Taylor) from Muppet Babies; Michelangelo (Coleman) from Teenage Mutant Ninja Turtles (who was left off of promotional material); Huey, Dewey and Louie (all Taylor) from DuckTales (replacing the proposed use of Mickey Mouse, Donald Duck and Goofy); Slimer (also Welker) from The Real Ghostbusters; and Looney Tunes Bugs Bunny and Daffy Duck (both Jeff Bergman, marking the first time either character wasn’t voiced by the recently-deceased Mel Blanc). Because of the public service nature of the project, the characters’ various license-holders granted royalty-free access to them. You know you're high when the smoke starts to smile at you. Buena Vista Home Video handled the home releases of the special, which featured an introduction by then-American President George H. W. Bush and First Lady Barbara Bush. These tapes were made available both at McDonald’s restaurants and for free rentals at libraries. 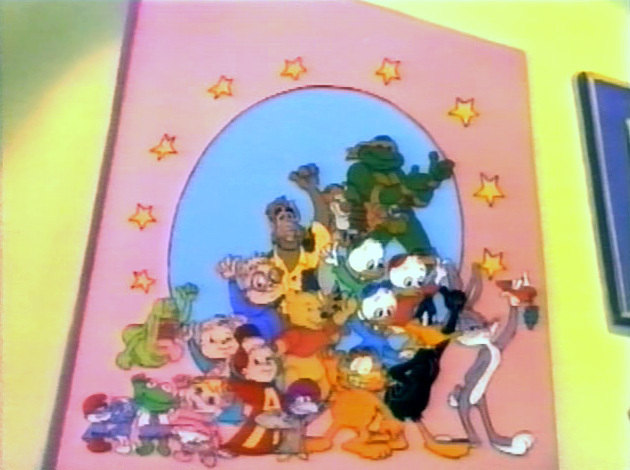 To promote the film, pamphlets were distributed in McDonald’s restaurants and Barbara Bush recorded several television commercials. However, advertisements for it were careful to underplay the anti-drug angle and instead play-up the crossing over of so many favorite characters. 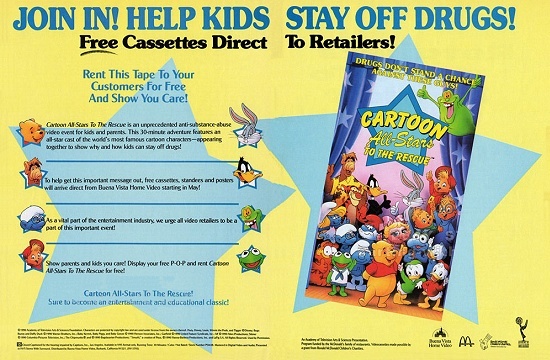 Retailer promo for the VHS release. Over the next year, the special was translated and played in various international markets. In most countries, that nation’s leader introduced the special in place of the President: Prime Minister Bob Hawke for Australia, Prime Minister Jim Bolger for New Zealand, Prime Minister Brian Mulroney for Canada, and President Carlos Salinas de Gortari for Mexico.